Smoothfoam balls are lightweight and dense – the perfect base to make custom beads for pendants, necklaces, bracelets, and especially earrings. Make a hole through the center of each ball with a tapestry needle. Push the ball onto a toothpick (to use for a handle), then coat the ball with tacky glue. Starting at the top hole, hold the end of the sequin string in place with a straight pin while you wrap the sequins around the ball. The thread holding the sequins together should face the surface of the ball. Trim the end, then set aside to dry. Place a bell cap finding over each hole then push the eye pin through the center of each ball. Trim the straight end of each eye pin to about 1/2″ from the top, then use pliers to create a loop. Attach the earring wire to the top and a bead dangle at the bottom. 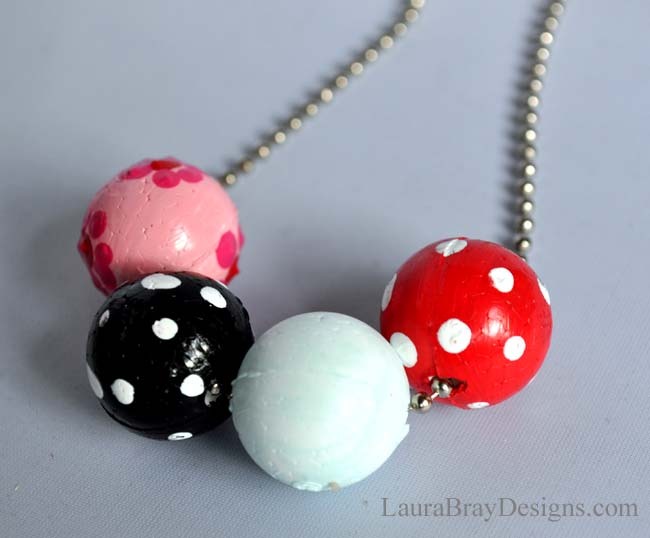 Use this same technique with 1″ balls, your choice of beads and 1/8″ wide ribbon or cord to make a larger bead for a matching pendant. 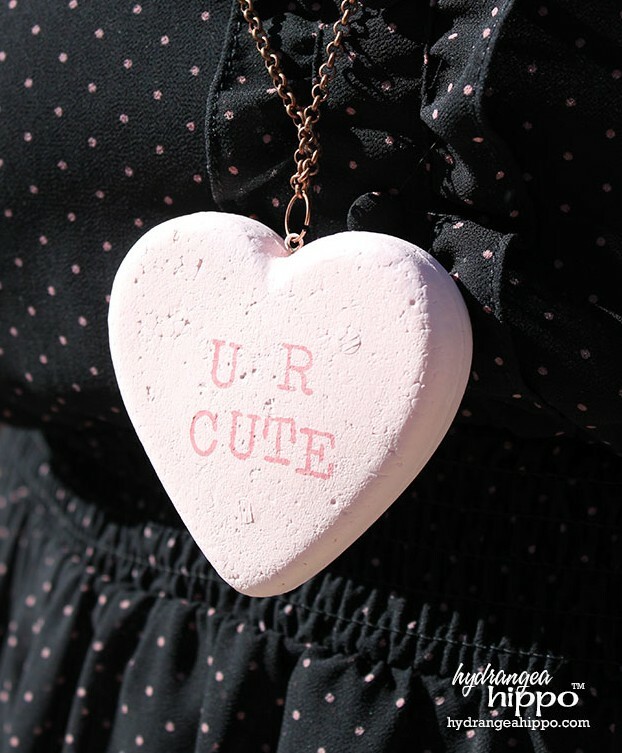 Conversation hearts are always a sentimental staple for Valentine’s Day and this year I am seeing them pop up in home décor and fashion more than ever. 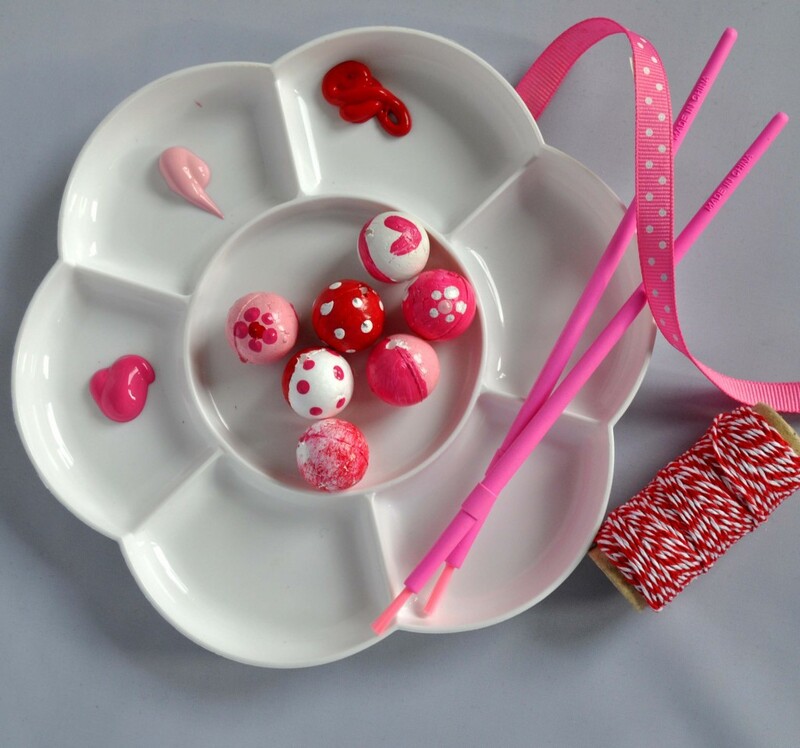 From jumbo conversation heart décor pieces to pillows to floral arrangements, conversation hearts are a sweet way to show the love and get into the St. Valentine’s spirit. 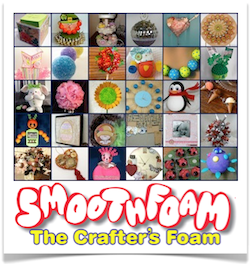 Smoothfoam is perfect for creating conversation heart crafts. 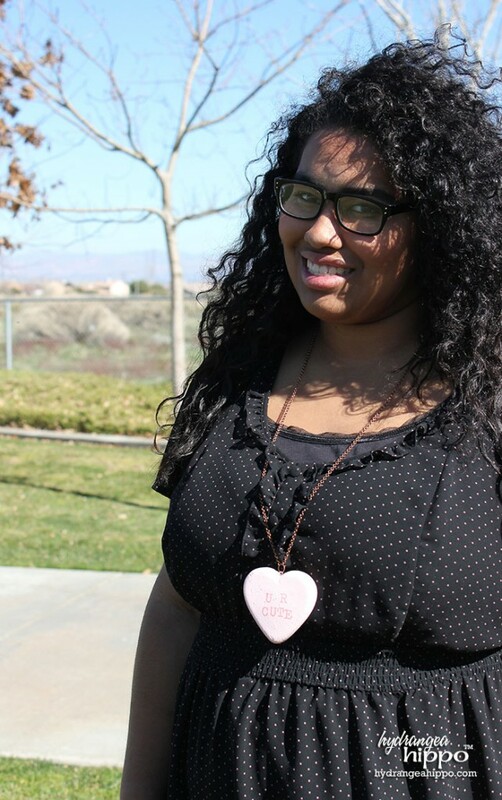 I made a simple, kitschy necklace that moms can wear to the office or teens can wear to the high school dance. 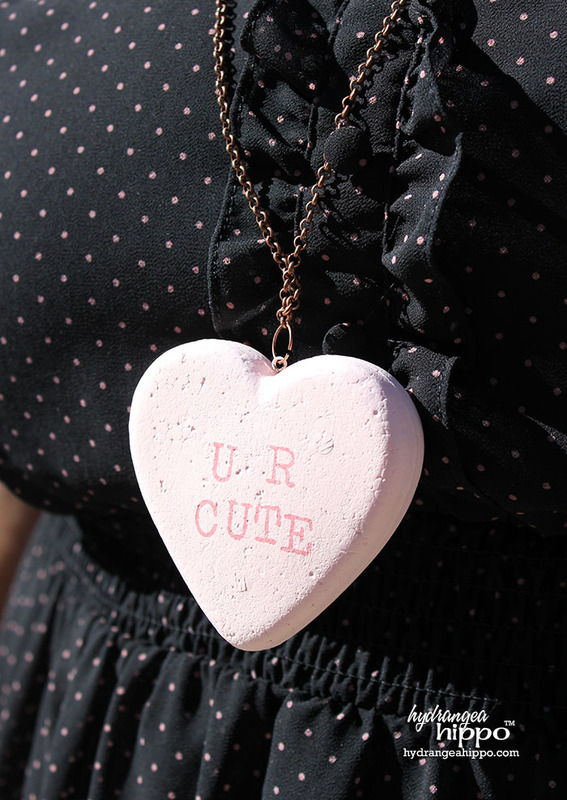 My daughter Katie loves this necklace and plans to wear it to school all week until Valentine’s Day. I guess I have to make another one for myself! Coat the bottom of the eye pin with E6000, push it into the top of the heart, wipe away any excess glue and allow to dry. Stamp a sentiment on the front of the heart with red ink. Attach the heart to a length of chain with a jump ring. Ready to wear and enjoy! 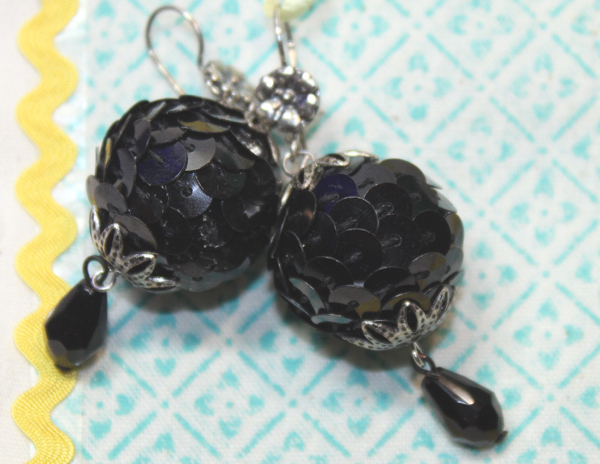 This sparkly “disco ball” sequin pendant was one of our Make & Take projects that we shared in our booth at the 2014 Craft & Hobby Association Mega Show. 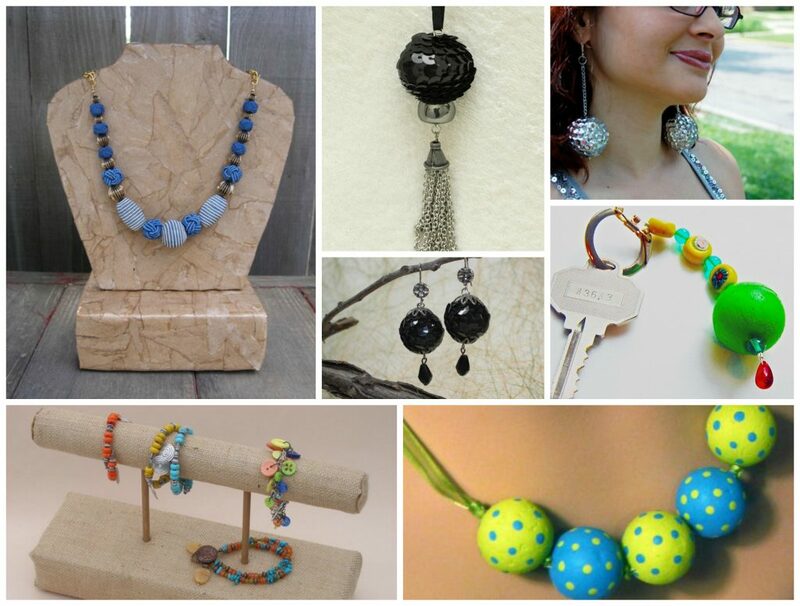 The 1″ Smoothfoam ball is perfect for earrings, mini ornaments and lamp pulls, too. 1. Push a toothpick thru the center of the 1” ball to use as a handle. Brush glue over the entire surface of the ball. 2. Anchor one end of the sequin trim to the opening at the top of the ball with a sequin pin. 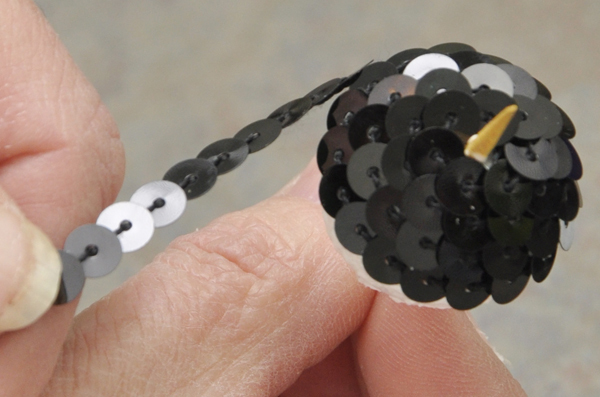 Wrap the sequins around the entire surface of the ball. Twirling the toothpick with one hand while wrapping helps this process. Make sure the thread side of the sequin trim lays against the ball. Use a straight pin to gently push strands together as you wrap. Pin the opposite end of the sequin trim up against the hole at the bottom to secure. Carefully remove the toothpick so it doesn’t end up getting glued to the inside of the ball, then set aside to dry. 3. 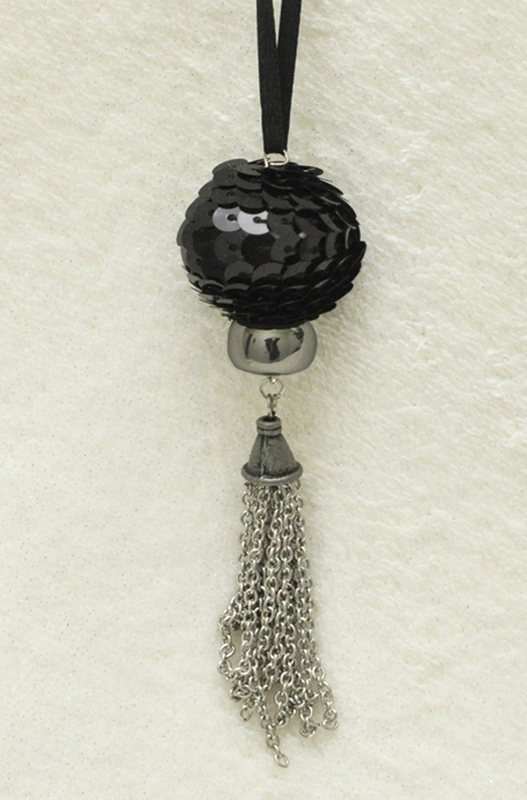 Attach the dangle to the loop on the eye pin then place the focal bead onto the eye pin. 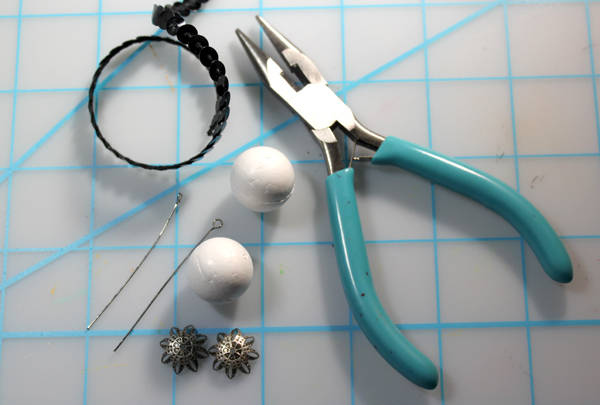 Push the eye pin up thru the center of the ball from the bottom, then use the round pliers to make a loop at the top. Thread the ribbon through the top loop and knot the ends to finish. Sequins and Smoothfoam are in fashion! Who said disco was dead? 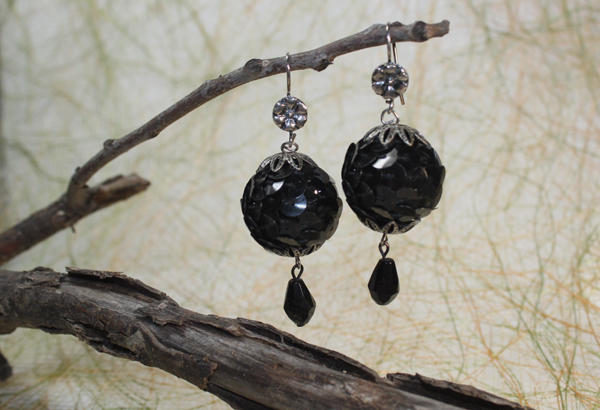 Add some sequins to Smoothfoam and you’ll have a pair of fashionable disco ball earrings that will have you swinging to your favorite dusty dance mix. They’re super light, despite their size. Wear them out on the town tonight – they’re sure to get attention! 1. Poke a hole with the awl straight through the center of each Smoothfoam ball, top to bottom. 2. Spread a little glue on one section of a ball. Pour a little glue on your work surface and dip a toothpick into it, then use the glue tip to pick up a sequin and position it on the ball with the cup-side facing outward. 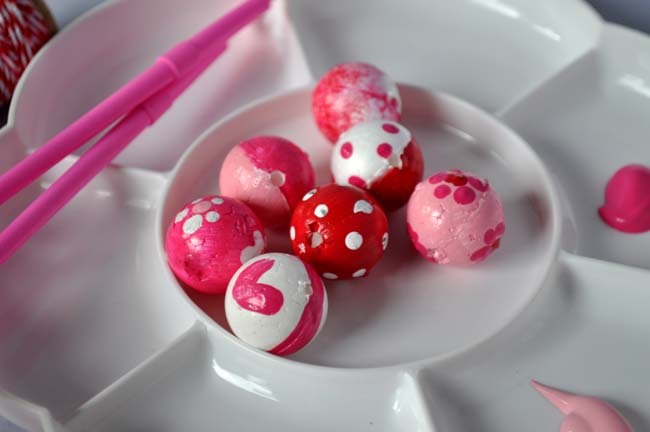 Cover each ball with sequins like this – poke another toothpick into the bottom of the ball as a handle to hold. Poke each ball into a scrap piece of Smoothfoam and allow to dry thoroughly. 3. Add a bead to the bottom of a head pin and slide the pin up through the sequined ball. Put the pin through the last link of one chain and curl the tip of the headpin into a loop with the round pliers. 4. Add the ball and chain to an earring wire with a jump ring, using both pliers, repeat with the second ball. 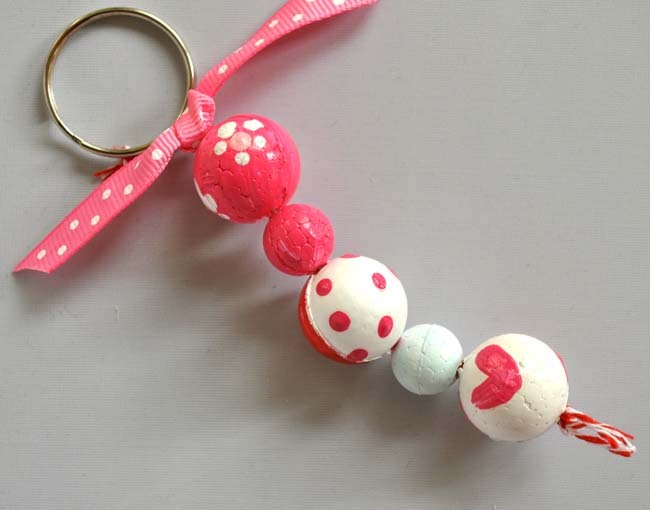 Custom-make your own polka dot beads with mini Smoothfoam balls. 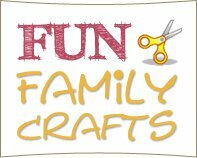 They are super easy and loads of fun to do! I was inspired by the colors of a cloudless spring sky and fresh shoots of grass, but you could make your beads in any color you wish. 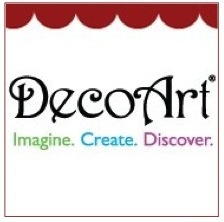 Want a chance to WIN $100 worth of Smoothfoam sheets and shapes? Just leave on comment on this post (click the “replies” link below) and come back to leave a comment on every post in March to enter! That’s up to 31 chances to win…good luck! 1. 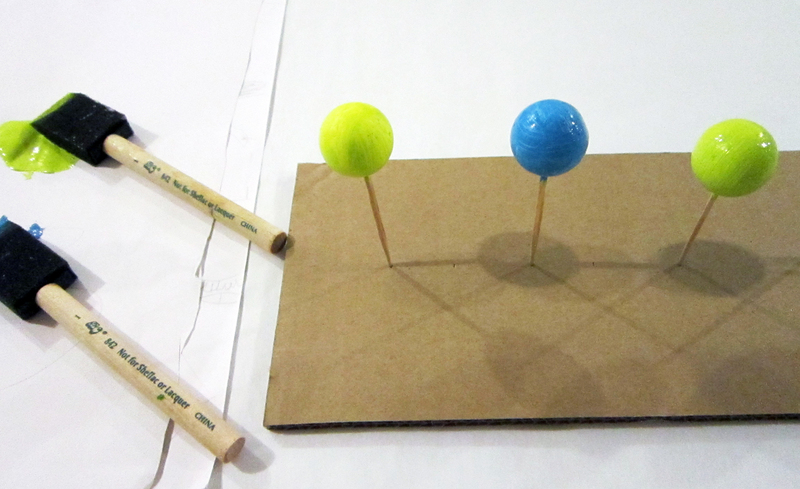 Poke a toothpick into each ball and set in onto the cardboard. This makes the balls easier to paint. 2. Paint two coats of paint on each ball (3 green and 2 blue). Allow the paint to dry between coats. 3. 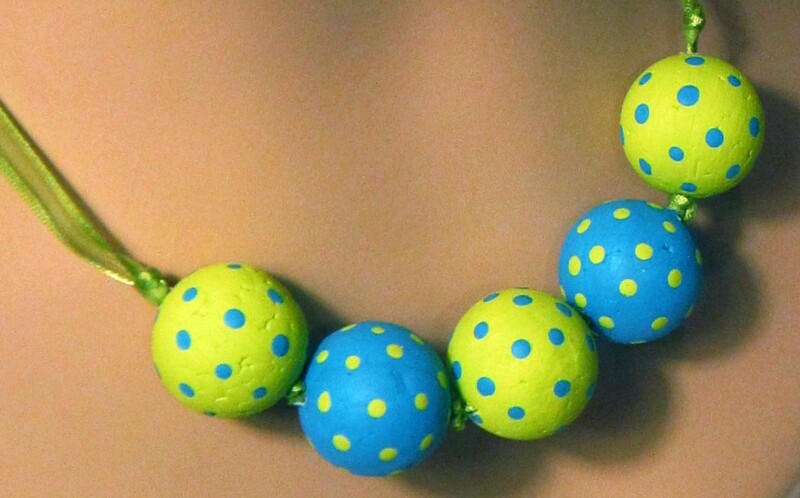 Paint polka dots in the opposite color on each ball. To make nice neat dots, dab the back end of your paint brush into the paint to make the dot; allow to dry. 4. Poke a hole all the way through the center of each ball with the needle. 5. Thread the ribbon through the needle, then thread one of the green balls onto the ribbon and push it to the center of the ribbon. Make overhand knots on each side of the ball. Add a blue ball, make an overhand knot, add a green ball, and make an overhand knot. Remove your needle, then thread the other half of the ribbon through it. Alternate the colored balls and knots on the other side in the same way. 6. Cut the ends of the ribbon on an angle and make overhand knots at each end. To wear your necklace, tie the ends into a bow at the back.